The developer has acquired a 50% stake in the Baltyk Srodkowy II (BSII) and Baltyk Srodkowy III (BSIII) sites from Polish energy company Polenergia. Both projects are in an early development phase, and are to be located 27 and 40 kilometres, respectively, from the port of Leba in the north of the country. Statoil is also entering a 50:50 joint venture (JV) with Polenergia to advance the two projects with Statoil managing the development, construction and operational phases of the projects. Statoil's executive vice president of new energy solutions, Irene Rummelhoff, said the company aims to invest up to €10 billion in "profitable renewable energy" by 2030. "This acquisition strengthens our presence in the Baltic Sea area giving opportunities for scale and synergies in a longer perspective," she added. Statoil added the Polish Baltic Sea "has a potential in excess of 8GW, where the first 4GW could be in operation by 2030". A WindEurope report published in September put the potential Polish offshore capacity at 3.2GW under a "central scenario", which assumed the EU meeting its 27% renewable energy target, further cost reductions, and "significant progress" in system integration enabling higher penetration of renewables. Rummelhoff added: "We are entering a market with growth potential through two of the most advanced offshore wind developments in Poland. "The country is well-placed to develop a strong offshore wind industry that would create jobs and value in one of the most dynamic parts of the European market." The closing of the transactions with Polenergia, in which investment firm Kulczyk Investments owns a majority stake, is subject to consent of the president of the office of competition and consumer protection in Poland. Baltyk Srodkowy II won environmental approval in April 2017, and a construction permit is expected by 2019. 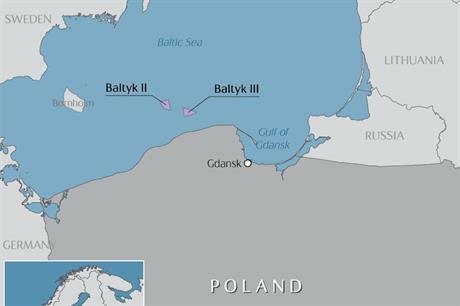 Meanwhile, Baltyk Srodkowy II had been given environmental approval in August 2016 with a construction permit expected to follow this year. When operational, either project would be the country’s first offshore wind farm. Statoil, alongside E.on, is already developing the 385MW Arkona offshore wind farm in the German part of the Baltic Sea. It also operates three offshore projects off the coast of the UK: the 402MW Dudgeon and 317MW Sheringham Shoal sites, as well as the 30MW Hywind project, the world’s first floating wind farm.